Opening up new career paths and educational opportunities for people with vision impairment, the system combines a number of pattern recognition technologies into a single platform and, for the first time, allows mathematics and graphical material to be extracted and described without sighted intervention. 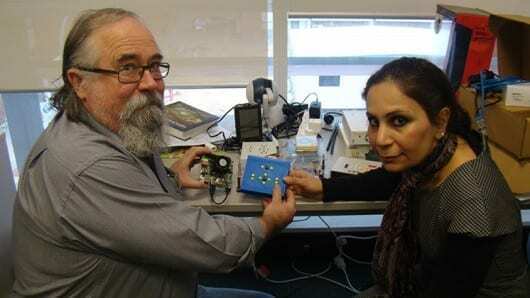 Senior Lecturer Dr Iain Murray and PhD student Azadeh Nazemi of Curtin’s Department of Electrical and Computing Engineering developed the device to handle the extraordinary number of complex issues faced by the vision impaired when needing to read graphics, graphs, bills, bank statements and more. “Many of us take for granted the number of graphics and statistics we see in our daily lives, especially at work. We love to have graphics and diagrams to convey information, for example, look at how many statistics and graphs are used in the sports section of the newspaper,” Dr Murray said. April 18, 2019 - Roff sixth-grader wins Braille Challenge award at Oklahoma School for the Blind TheadanewsMUSKOGEE — Braille literacy is the key to education and eventually employment for many students with vision impairments. March 29, 2017 - Making graphics accessible to the visually impaired GCN.comNew tools are making it easier for agencies to comply with *content* accessibility requirements.